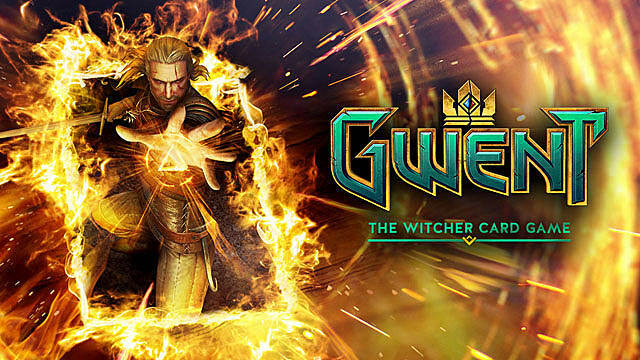 The standalone Gwent card game is a slightly different experience than the one found in The Witcher 3. 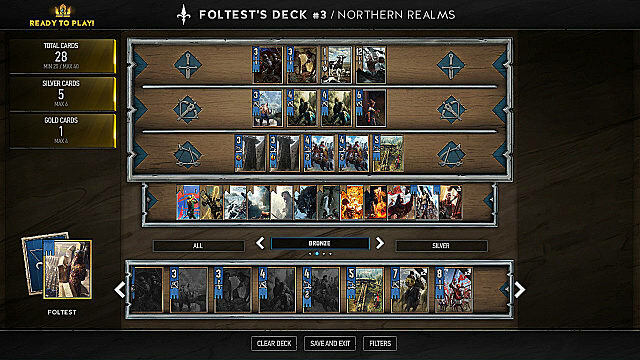 It offers a whole new perspective on deckbuilding, decision-making, and leveling up. 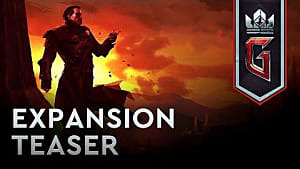 The game has been in closed beta for some time now, and everyone who has received the invitation can start playing it for free. But before playing, you must know what it takes to create your first competitive deck, how to play it well using winning tactics, and how to take your deck to the upper echelons of success. 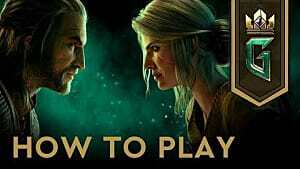 This guide will help you start playing Gwent in the right manner, which will hopefully prevent you from making too many mistakes. 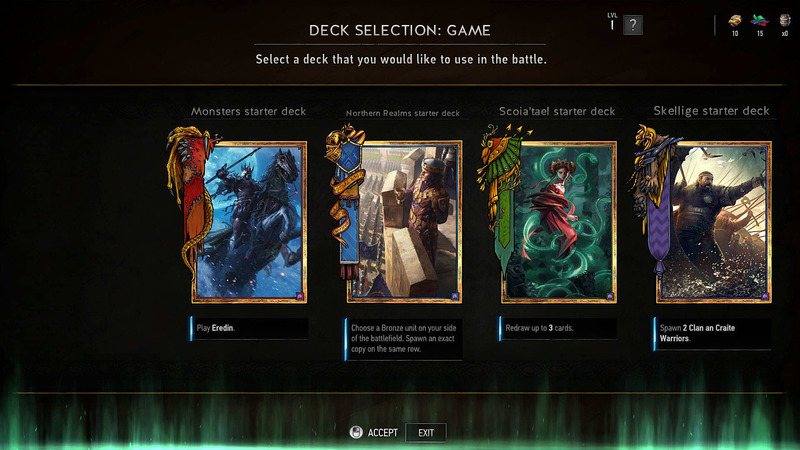 Before building any type of deck in Gwent, you must first introduce yourself to all five factions that are currently available in the game. Each faction has its own advantages and dedicated archetypes. 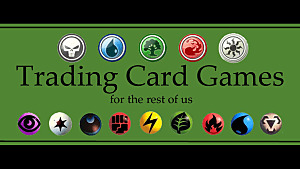 So take some time in the beginning and play all starter decks in casual format to get the feeling of each faction’s abilities. You can open your Kegs and spend Ore to buy more cards, but don’t craft anything using Scrap yet. After you play with each faction’s decks, you should decide which one you like the most, whether it’s Skellige and Northern Realms that rely on base strength, Nilfgaard that draws you more cards, Monsters that produce and buff tokens, or Scoia’tael, which lets you choose who plays first. After you make your decision, you can mill the cards of other factions, and in this way, you will have enough Scrap to craft your first competitive deck for the faction of your choice. Focus on your deck and train as much as you can. In time, you will have enough Ore and Scrap to start building another deck. As soon as you reach level 10, you will be able to climb the ladder against other top players. The rewards will get bigger and you will get more Scrap to craft more and better cards. At that point, you won’t need to mill anything anymore. Instead, just keep all the cards that you open and focus on playing more matches. 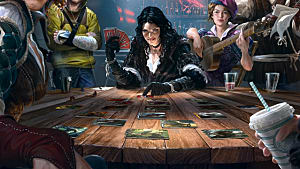 Each deck in Gwent may include up to 4 Gold cards and 6 Silver cards. Gold cards are especially important, as they usually decide the result of each match-up. What;s more, they are immune to most effects in the game. Silver cards are just as effective, and you should try to fill all the available slots in your deck with these powerful cards. 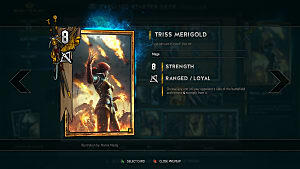 The most powerful neutral Epic card in Gwent is Geralt. It costs 200 Scrap to craft, and it is the best possible investment in the beginning of your run. You can use it in any type of deck, and it will always play a significant role in every match-up. 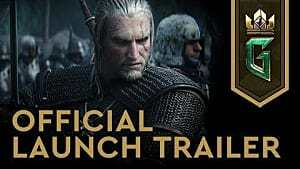 But besides Geralt, you will need to play some other cards, too. The minimum requirement is 25 cards per deck, and the maximum is 40. It is wrong to think that the more cards you have, the better your deck is. On the contrary: try not to overextend; keep your decks at 25 cards -- in this way, you will have a larger chance of drawing your most powerful picks. One of the most fundamental win conditions in Gwent is the card advantage. So, when it comes to Common cards, be sure to include effects that draw you more cards. For example, Elven Mercenary is a cheap card with premium effect, as it draws another card from your deck, although a non-Golden one. Another tactic to draw all your special cards sooner involves playing cards with the Discard effect, such as Clan Dimun Pirate. It removes all other Dimun Pirates from your deck, and this increases the chance of drawing your Gold cards. 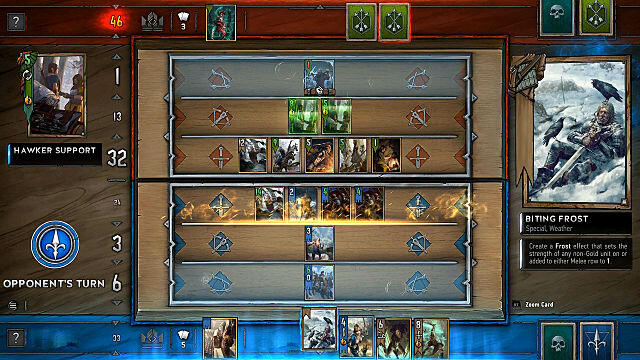 One of the most controversial but truly powerful tactics in Gwent is Spying. It involves Disloyal spies (e.g. Prince Stennis) that play on the side of your opponent, but give you something in return -- usually, more card draw. You should play them in the second round (after you win the first one), which you will lose, but as a result, gain more cards for your victory in the third and final round. 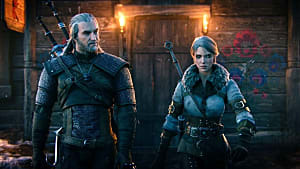 Geralt: Igni is one of the strongest cards in Gwent, and that is why you should always play around it. Igni destroys the strongest non-Gold units on the enemy’s row, if that row has 20 or more strength in total. This means that you should never put more than 19 strength on one row. Scorch (which destroys the strongest non-Gold units on the battlefield) is another dangerous card that you should always be aware of. Try not to play two or more powerful cards with the same strength, or they will most likely get destroyed. Yennefer: The Conjurer -- removes 1 strength from the strongest opposing non-Gold units. Ocvist -- removes 1 strength from all of the opponent’s non-Gold units, and then returns to your hand. Aeromancy -- spawns either Biting Frost, Impenetrable Fog, or Torrential Rain. 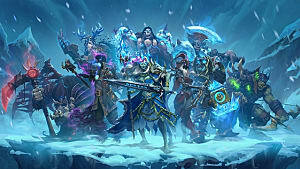 In the end, play a lot and learn as much as possible about the most popular archetypes in the current meta (as this is a beta build of the game, there may be some aspects that eventually change). But when you know what your opponents have in their decks, it will be easier for you to play around the most dangerous traps. 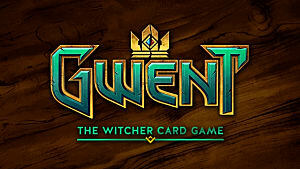 Come back soon for more Gwent guides at GameSkinny! It's in The Cards: Which CCG Will Dominate in 2017?